I haven't commented about Hillary Clinton's declaration that she's running for president. It's not because it was a foregone conclusion and therefore a non-event. And it was not because I haven't had as much time to blog this year compared to years past. Both of those points are true to some extent but they are not the reason for a dearth of Hillary bashing from me. 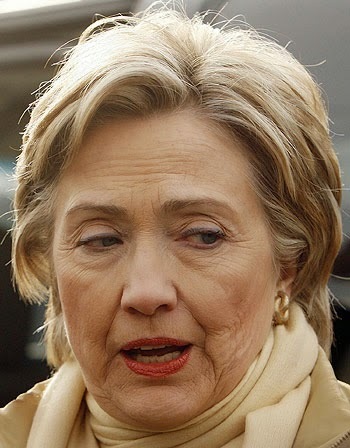 The real reason, is that after years of Thursday Hillary Bashes, I'm bored of her. Call it Hillary fatigue. Should she become the next president there will be a wealth of problematic issues about which to blog. I'm not sure I'll be able to muster the desire to do so, though nevertheless, I will. But my desire is not to continue to chronicle ineptitude in the White House, but rather to remove it, and take part in the discussion about a real, worthwhile way forward. All that aside, there is a political consideration worth mentioning concerning Hillary Clinton and fatigue. If I were a GOP strategist, I would harp on the notion of Hillary fatigue. She's old. Remember the Democrats harping on the age of Ronald Reagan? Sure, they were unsuccessful, but the electorate today is younger in large part. Obama youth can be turned off of Hillary Clinton. That's important from an electoral viewpoint. And it's arguably different from turning them off of voting and civics. She does not equate to that. Hillary Clinton will show flashes of energy and vibrancy in her candidacy. But she will also show signs of fatigue. That should be highlighted. More importantly than her age, is the fatigue associated with her ideas. They are stale. They are tried and failed. They offer no way forward, only more of the same as from Obama. Then there's scandal fatigue. That too should be a major theme. Strategy aside, I have to wonder if others might feel the same about her. Particularly in the media. They abandon her surprisingly quickly in 2007/2008. While they may be back on board for now, I bet a challenge of any strength from another Democrat with any sort of interest factor for them would have the same result. Hillary Clinton fatigue might just save the nation.